Jazz music plays in the background. Women are clad in flappers, with stockings and cloche hats, or draped in furs and boas. Men are dressed in both zoot or gangster suits and Fedora hats. Almost a hundred of these dazzling guests gather at the Villa Immaculada in Intramuros on July 28—despite the heavy downpour—to celebrate the 80th birthday of Rodolfo Vera Quizon. Zsa Zsa Padilla, Dolphy's lovely partner of 20 years, is the main force behind the event. She's the one who came up with the theme, coordinated with people, and prepared most of the details. It's such a natural high for the Divine Diva to see Dolphy "happily surprised." "Okay naman. Nakikita mo 'yung mga dati mong kasama muli, ah, hopefully magkita-kita uli kayo, kasi marami na ring nalalagas," says Dolphy about the party. He adds in jest, "Masaya naman ako dahil nakikita ko 'yung mga dati, 'yung mga antique." 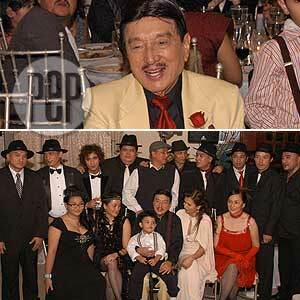 Strictly speaking, Dolphy is just turning 79. He was born on July 28, 1928. It's the family's choice, on feng shui advice, to skip his 79th birthday. Zsa Zsa explains, "He's actually seventy-nine, but [we] started ten years ago to celebrate like, you know, his sixty-ninth [as] seventy—a year ahead—so he's celebrating his eightiethbirthday for this year. Sabi nila, parang you get sickly and stuff like that, so just to, you know, for better luck, you have to celebrate it twice daw and make it eighty na." BIRTHDAY MESSAGES. Is there anything that Zsa Zsa wishes for her beloved? "I just wish him a good health, that's why we're throwing him a big party. Only good health for him because he's such a wonderfully gifted man, and I want him to be able to share this gift of laughter to everyone [while], you know, he can," expresses the singer-host-actress. The party also serves as a reunion for the Quizons. In fact, two of Dolphy's children arrived from the U.S.—Manuel, the dad of Boy2, and Kit. A relative remarks, "Ganito kasaya ang reunion ng mga Quizons. Ang dami kasi, 'tapos ang babait nila. Imagine mo, si Tito Dolphy, eh, Comedy King, pero naglalakad-lakad at umiikot-ikot lang dito sa hall nang hindi pansin ang effect ng presence niya." PEP (Philippine Entertainment Portal) sees this as an opportunity to meet the children of Mang Pidol, his other nickname in showbiz, and ask them for a birthday message. VANDOLPH (Dolphy's love child with actress Alma Moreno): "He has everything...so good health more power, and full of happiness in his heart. Just be happy ‘coz a lot of people is [sic] here for him...lalo kaming dalawa [referring to his girlfriend Jenny]." ZIA (Dolphy's youngest daughter): "I just want him to, I dunno, rest. Get rest and get better ‘coz you know, I want him to live a longer, fuller life—not that it's not naman full. I want to still keep on going strong." BOY2 (Dolphy's grandson): "Wish? Young, healthy, you know what I mean, keep on moving [given] the stuff he is doing everyday. The good thing about him, he doesn't rest. It's all because that's his passion already. He likes to work all the time, that's what he wants to do all the time. Hindi puwedeng tumambay sa bahay ‘yan ." He continued, "I want to see him for another 50 years, 'di ba. There's only one Dolphy, and 'yun na lang 'yung ginagawa naming mga young generation now, we thank him so much and that's it. I just want him to be happy." ROLLY (He also played as his dad's son in John en Marsha): "I know my dad is a fighter. Marami siyang naging pagsubok and problema, lahat...Malakas siya sa Creator, and sana umabot pa ng kahit mga twenty years na lang. And ah, pinipilit din naming magbagong mga magkapatid, huwag na siyang bigyan ng sakit ng ulo...We love you very much." MANNY (the eldest): "Sana magkaroon pa siya ng mga one hundred more years para lahat ng mga tao na gusto siyang magpatuloy na magpatawa. Sana laging malakas ang katawan niya at maraming nagdarasal para sa kanya. Mahal na mahal namin talaga siya." EPPIE (just like his dad, he's part of showbiz): "All the success, all the love, all the blessing, and of course, good health for this year. KIT: "Hi, Dad. Happy birthday! Happy 80th birthday! Hey you know I Love you, we came all the way from New York just to be here for you." SAHLEE (She was once a moviestar. ): Dad, thank you so much for everything. You're the best dad in the world, happy birthday! DINO: "I'm so proud of you, and we're so happy everybody's here, and I love you very much." RONNIE (He joined his dad in some of his TV and movie projects. ): Daddy, I'm so glad you're still here with us, happy birthday. Stay strong, stay healthy. I really wish you have many more, and more power also. And I love you very much." ROMMEL: "Good health, more years to come, peace of mind. I love you, Dad. Happy birthday!" EDGAR (He also tried his hand at acting. ): Dad, happy, happy birthday! I love you. Sana marami pang birthday na dumating, and sa mga kasalanan ko, I'm very, very sorry. Pipilitin kong hindi ka na masaktan sa mga ginagawa ko, sa mga desisyon ko sa buhay. I love you, Dad." The Comedy King's birthday is very much like the man—it's grand, it's warm, and it's so much fun! More celebrities extend their birthday message for Dolphy, just click the gallery.